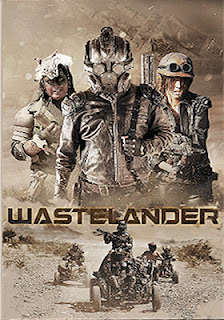 Circle Feb. 20 on your DVDs-to-see calendar as word arrived this past week that Indican Pictures has tagged that date for the DVD debut of writer/director Angelo Lopes’ post- apocalyptic thriller, Wastelander. 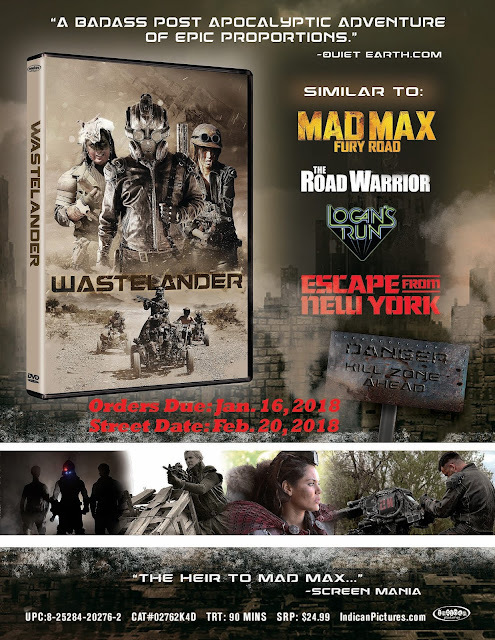 A limited threatrical run of Wastlander is planned just prior to DVD launch, which promises to be the first installment in a trilogy. 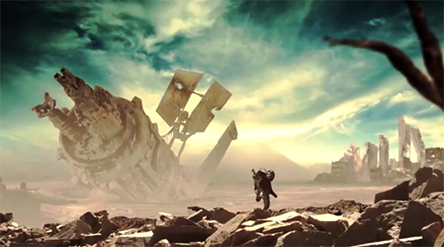 Rhyous Solidor (Brendan Guy Murphy), a former soldier, is a wanderer in the wasteland, only vaguely remembering bits and pieces of his past … visions of “Eden” haunt him. One day he happens upon an odd assortment of fellow survivors, whose leader is only sustained by his “cryo” suit, but who does confirm that such a place exists. In a clever mix of Mad Max meets Prince Arthur, our “knightly” hero embarks upon his quest to find this lost “Eden” with a motely group that includes the resourceful “mechanic” Neve (played by the alluring Carol Cardenas — Zero Point Theory, The Z, etc.) and the screw-loose Solek (Jon Proudstar — Jackrabbit Sky, Legend of the Phantom Rider). The only thing that binds them together is their collective fear of The Scourge, a band of ruthless killers who roam the wasteland doing as they please and taking what they want. Oddly, The Scourge actually fear the presence of “Eden” and that makes it all the more imperative that Rhyous and his group succeed in their quest. The street date for the DVD release is Jan. 23. The film had a brief theatrical showcase run in December, which yields an ARR of 32 days. His scam is to move from small town to small town with his tag-along girlfriend, Rebecca (Mariana Paola Vicente — Self/Less, Nocturna), preaching to the locals — he’s actually pretty good at it — to get enough money for the next motel, the next round of drugs and enough booze to make him forget what a lowlife grifter he is. When a pair of young thugs decide one evening that he’s an easy mark things happen … unexpected things, that is, as Johnny is able to revive one of his attackers from the dead (the results of a stray bullet). Rebecca listens to his tale, but thinks it’s the drugs or booze talking. It happens again, this time he causes harm to an old man by accident and then makes it right. She’s now a believer! The power to heal … it proves to be both a blessing and a curse as events unfold and the sins of the past have a strange and ironic way of overtaking this newfound “healer” and his faithful companion. 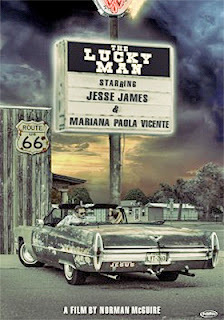 The Lucky Man is a strange, strange roadtrip … one that is worth taking coming Jan. 23 when it becomes available on DVD.